De facto regional government discouraging return of Assyrian refugees, critics say. JERUSALEM (Morning Star News) – Kurdish authorities in northeastern Syria have closed private schools administered by the Syriac Orthodox Church, which Assyrian Christians say threatens the survival of the Christian community in the region. The schools in the Kurdish-governed northeastern region of Syria were forcefully closed for refusing to implement a curriculum that school officials say undermines their religion and culture, promotes Kurdish nationalist ideology and ignores a long and painful history of Assyrian persecution at the hands of Kurds. The academic director of the schools, a leader of the Assyrian community, has since been beaten, and an Assyrian journalist who wrote extensively on the closings was detained. Assyrian advocates say these actions reflect a pattern of intimidation toward Christian minorities and others who oppose the policies of the Kurdish self-administration. On Aug. 28 in Qamishli, militiamen belonging to the Kurdish-led Democratic Union Party (PYD), and members of the Sutoro, an Assyrian police force affiliated with the Syriac Military Council (MFS) and the Dawronoye, a secular, nationalist movement among Assyrians, expelled administrators and teachers from the schools. The militia expelled them because they failed to register and implement the curriculum imposed by the Kurdish-led government, according to a press statement from the Assyrian Policy Institute and local reports. When administrators refused to turn school building keys over to officials, militiamen broke and replaced the locks, according to the institute. It reported that schools in the same Al-Hasakah governate of Syria were closed earlier in the month in Al-Malikiyya and in Al-Darbasiyah. “The school violates the provisions of law by teaching curricula that are not approved by the Education Authority….for these reasons, we are issuing this notice ordering the closure of this school within 24 hours under legal obligation,” read the notice on the school of Al-Malikiyya. A similar notice was posted at the school in Al-Darbasiyah, according to the Assyrian Policy Institute. On the same afternoon that the Qamishli school was closed, hundreds of local residents protested and broke into the schools. Some of the schools, which serve area Assyrian, Armenian, Arab and Kurdish students, are operating unofficially now, Assyrian Policy Institute board member Max Joseph told Morning Star News. Members of the Assyrian community in the area believe two more incidents are directly related to the school curriculum controversy. On Sept. 22, Isa Rashid, a respected Assyrian community member who is the education director for the schools, was beaten outside of his home in Qamishli, days after meetings with officials in which he refused to implement the PYD’s curriculum. On Sunday (Sept. 30), the Syrian Democratic Forces in the region arrested an Assyrian journalist and Qamishli resident, Souleman Yusph. Around 9 p.m., Yusph was arrested and his laptop and documents seized by the authorities. Yusph was detained after writing and posting on social media about the school closings, criticizing the self-administration’s policies and actions of Assyrian neighborhood police funded and controlled by the Kurdish self-administration in Syria. The journalist’s whereabouts are unknown, and advocates are calling for his release. “This latest arrest is yet another attempt to quell any interest or understanding of how the Kurdish self-administration’s draconian policies are harming those living under its self-imposed authority,” read a statement released Sunday by the Assyrian Policy Institute. The PYD on Aug. 29 released a statement, posted and translated into English on the PYD foreign office Twitter account, which said that minutes of a meeting published online by church leaders in Qamishli were untrue and slanderous to the government. The statement asserted that the PYD seeks to support the schools and implement the rule of law, and that the schools in question are not private but seek to serve the Syrian regime. The Christian schools, which have been in operation since 1935, offer liturgical classes in Syriac while following the Syrian government’s curriculum, Joseph of the Assyrian Policy Institute said. 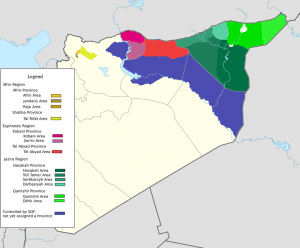 The Syrian government’s curriculum is accredited in greater Syria, Joseph said, while the Kurdish curriculum is not. Authorities would have allowed the school to keep its curriculum if the schools enrolled only Christian students, Joseph added, but Arab and Kurdish students attend the schools as well. 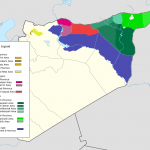 Assyrian critics add that the curriculum that the PYD has tried to impose since 2015 glorifies Kurdish history, the Kurdistan Worker’s Party (PKK) and includes idealized maps of “Greater Kurdistan.” This is a particularly sore spot for Assyrians and other Christians who have suffered massacres at the hands of the Kurds, some of whom cooperated with the Ottoman Empire during World War I in the genocide of Armenians, Assyrians and Greeks in the area that is now Turkey. The massacres forced Assyrian refugees to settle in cities such as Qamishli. During the conflict in Syria since 2011, abuses have persisted, Assyrian advocates say, with incidences such as checkpoint skirmishes, looting in abandoned Assyrian villages and land confiscations. The Kurdish government led by the PYD is backed by both Saudi Arabia and the United States, seen as the only viable allies in the region against Syrian President Bashar al-Assad and the Islamic State (IS), Joseph said. The PYD is the leading party in the Democratic Federation of Northern Syria, an autonomous region in northern Syria that formed after Assad surrendered the north to the Kurds during Syria’s seven-year civil war. While the Kurdish government touts Western values of being secular, egalitarian and multi-ethnic and is supported by a contingent of Assyrians, many Assyrian Christians say its Western supporters ignore the subtle forms of oppression it carries out, such as the imposed curriculum, which discourages Christian Assyrian refugees from returning to the region. In Qamishli, founded by Assyrians after the genocide in 1915, half of the 25,000 residents who belonged to the Syriac Orthodox Church (out of a total population of 40,0000) have left since unrest began in 2011. People started leaving in 2012 and 2013, and especially in 2015, when IS kidnapped more than 200 Assyrian Christians in the villages around the Khabor River in northern Syria. The school closings are a foreboding sign to many Assyrians that the Kurdification that happened in Iraq will also happen in Syria, said Juliana Taimoorazy founder and president of the Iraqi Christian Relief Council and senior fellow at the Philos Project. Assyrian Christians, she said, can also be strong allies of the West in the region.